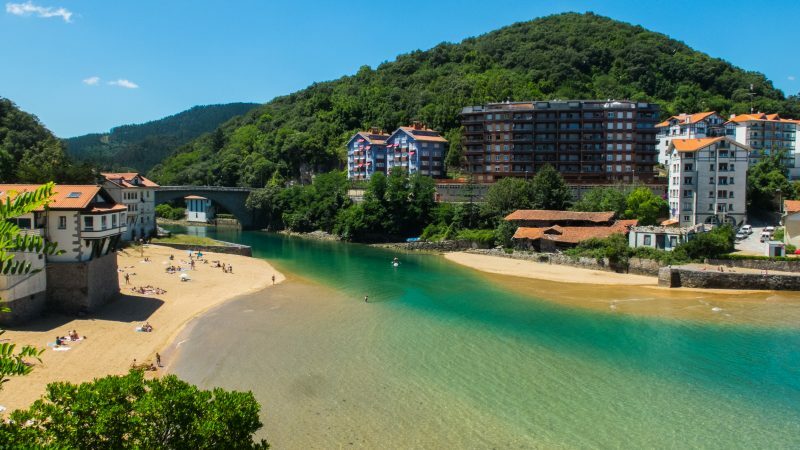 Well, I’ve gone and found the best budget city in Spain – and believe it or not, it’s actually one of Spain’s most popular. 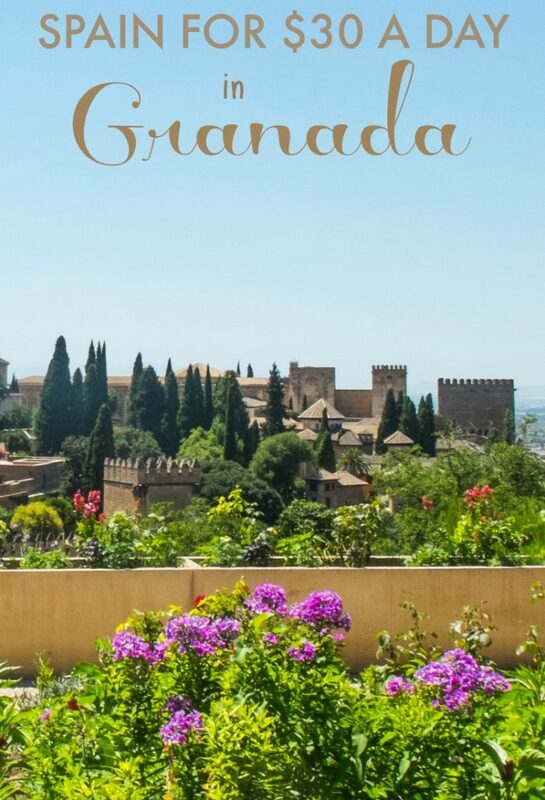 Gorgeous Granada is home to UNESCO darling and Seven Wonders of the New World finalist, the Alhambra. 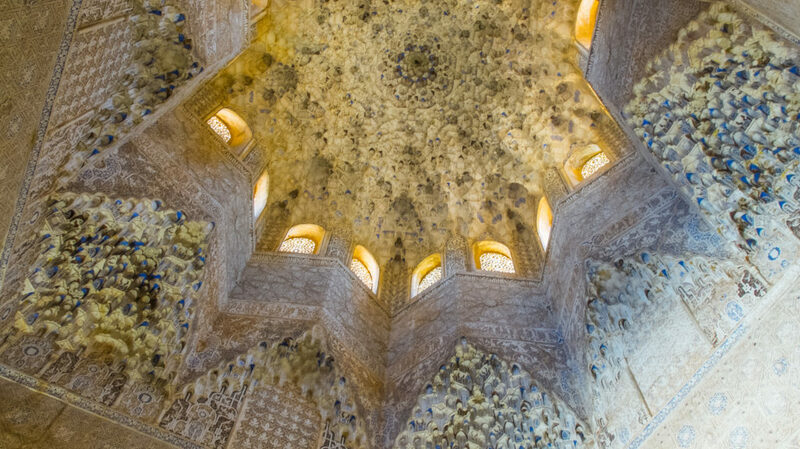 The Alhambra is Spain’s most visited attraction… yet the prices in the city don’t seem to match. 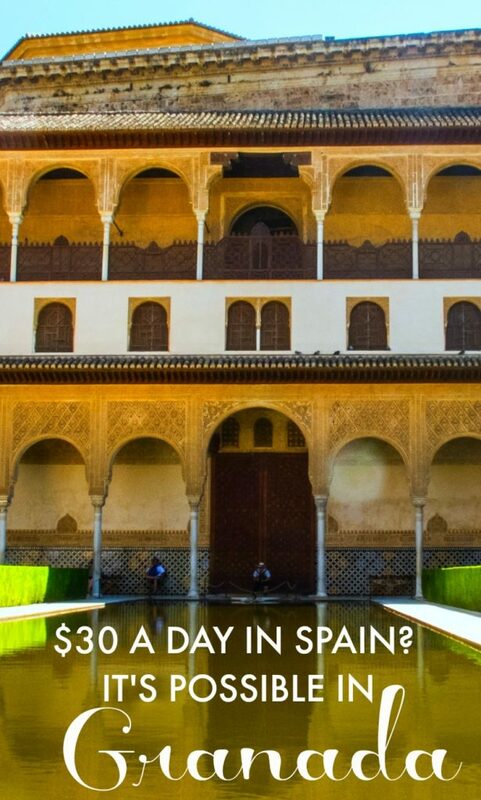 In fact, it’s not only possible to do Granada on only 30 dollars a day – it’s pretty easy. The key? Taking advantage of the lively free tapas tradition. 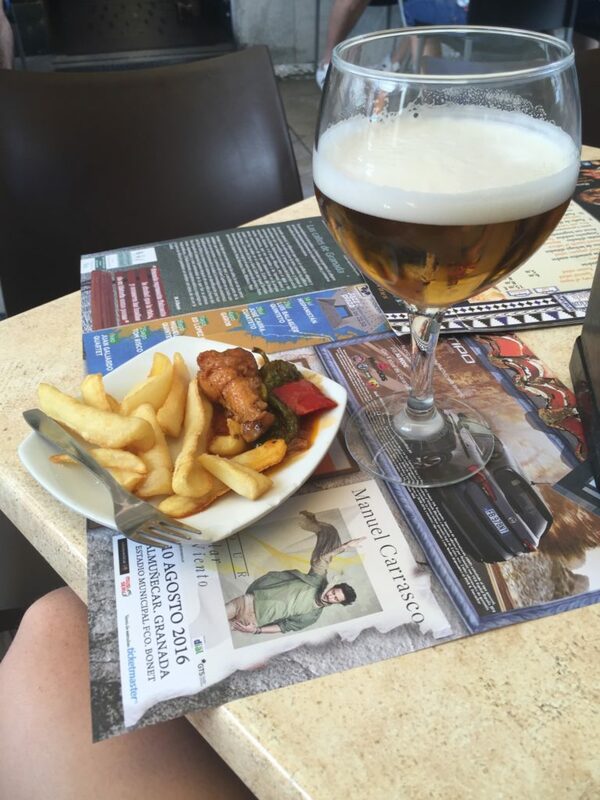 A drink typically costs anywhere from 2 euros to 2.50 euros, and it always comes with a tapa. 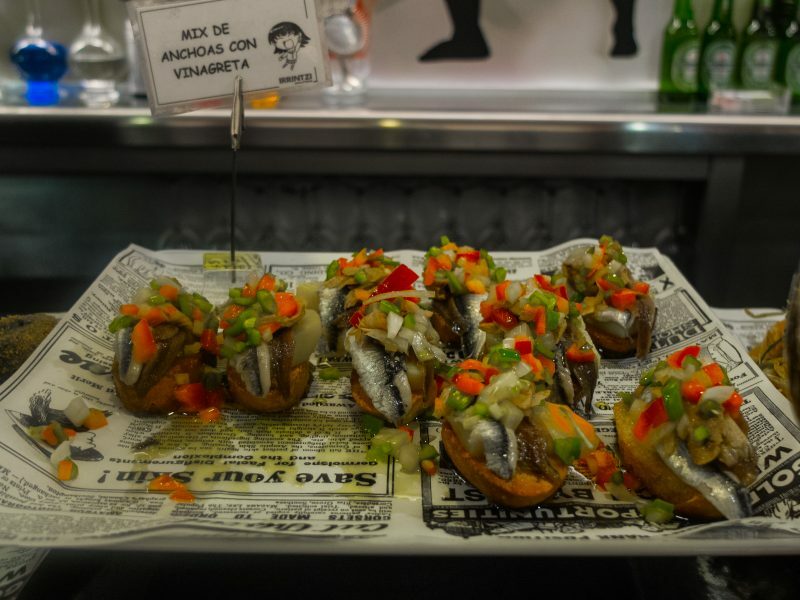 A tapa can be anything from some fries and a bit of stew to a plate of fried anchovies to a small helping of Valencian paella to fried eggplant with honey and beyond. Generally speaking, you don’t get to choose your tapa at most places, though some do. Also, if you stick to one establishment and order multiple rounds, the tapas are supposed to get bigger and better with each round, though I never really quite noticed a correlation. I could get full (and a bit buzzed!) for anywhere from 4 to 8 euros if I was really making a night of it, and I have a decent sized appetite. All this is two euros. Americans, please pick up your jaws from the floor. I also didn’t stay in the absolute cheapest hostel, as I prefer a more mid-range option with luxuries like AC in the hot Andalusian summers. The hostel I stayed in was 14 euros per night, and I highly recommend it. The cheapest rooms I saw were 10 or 11 euros a night, so you could definitely skate by for less if you’re cool with a bit less comfort. I needed a break after traveling at a fast pace for several months, so I took a longer than normal time in Granada. Other people with less time than me would probably find 48 hours in Granada to be just about sufficient. 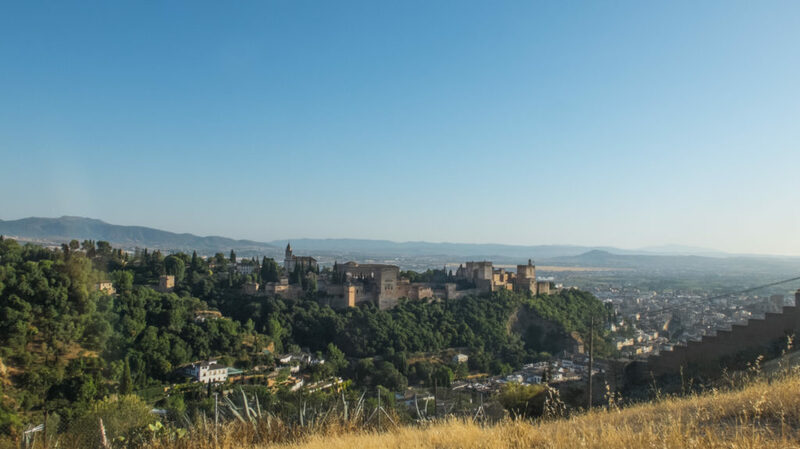 This view is free, but seeing the Alhambra up close won’t break the bank either. Water: 0.24 euros. There’s delicious, safe, potable tap water readily available all throughout Granada. I bought one 1.5 liter bottle at a grocery store and refilled it the entire trip. (*this is where you will range the most. These are the things I think you shouldn’t leave Granada without seeing, but your taste will vary. I also didn’t include what I tipped for the free walking tours since it’s voluntary and based on what your conscience will allow. For the record, I tipped 3-5 euros per tour, but others varied – a euro or two up to 10 euros). 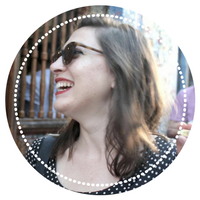 There is lots of fun free things you can do as well, like seeing the street art in Granada or wandering through the alleyways. Granada is the only place in the world that rewards my drunken antics, which is probably why I’m convinced it’s my destiny to live there one day. You will save quite a bit of cash if you tapa wisely rather than paying for raciones (plates). At certain locales, 4 euros will get you two drinks and a reasonable dinner (6 euros if you’re hungry, and 8 if you’re making a night of it). The two most popular and most affordable drinks are the caña (small) or tubo (large) of beer or tinto de verano, a delicious drink of red wine, soda water, and lemon. You may have your doubts, but trust me, it’s what you want in an Andalusian summer. These drinks will set you back about 2 euros to 2.20 euros a pop – if you go for mojitos, sangria, cocktails, or glasses of wine you will still get your tapa but you’ll end up paying more. 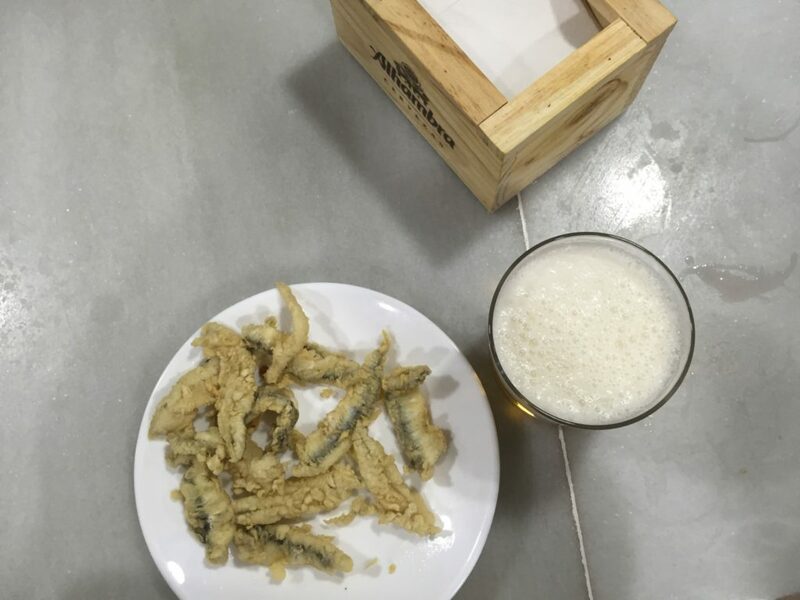 A giant plate of fried anchovies along with a beer – just two euros. 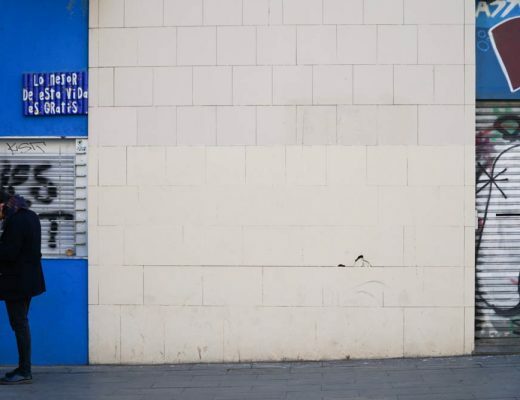 Granada has an odd system of advertising places to drink, where people working for bars will walk by – or even into – your restaurant where you’re eating and drinking to advertise their establishments. They’ll leave a business card with hand-written details of drink prices, and they’re usually quite cheap – I’m talking 1 euro for a beer or 2 euros for a mojito! These usually don’t come with tapas as these are bars, not bar/restaurants. However, if you’re full but want to keep the night going, this is the way to do it! Granada is so tiny that everything is walkable within about 30 minutes. The only exception is if you want to do a day trip, such as Güéjar Sierra or Monachil; then you’ll pay a paltry 1.20 euros each way. The bus station is also quite far out of town as well, so you’ll probably want to bus that too. You just gotta see Güéjar Sierra for yourself, trust me. 4. Enjoy the fresh mountain tap water! 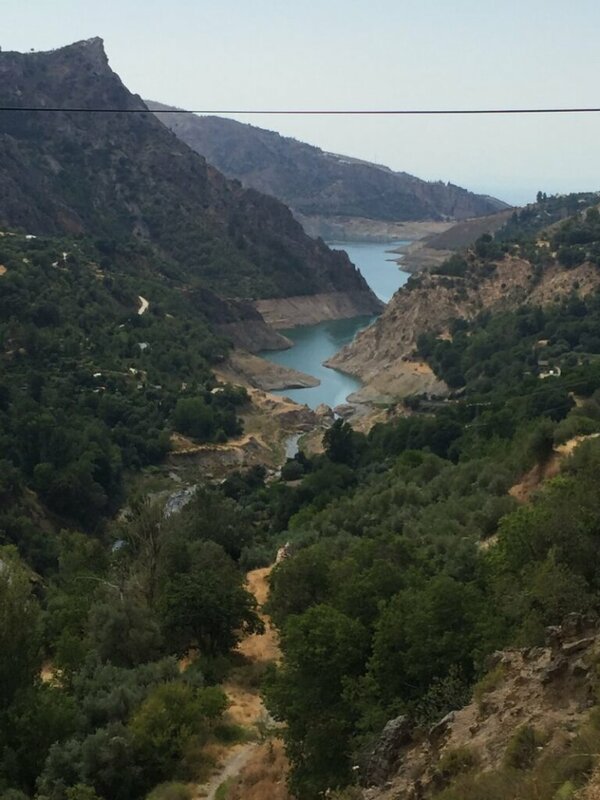 Granada has some of the freshest, purest tap water on the planet – so why waste money on bottles of water? I usually buy one cheap 1.5 liter water bottle from the grocery store each week and refill it in taps and public water fountains around the city. Note that a few are non-potable, but they will be very clearly marked if you’re not supposed to drink out of them! Granada has three excellent free walking tours. They do a historic tour of the city every day at 11 am. They also do alternating tours between the Albaicin district and the hill caves of Sacromonte at 6 pm – Sundays excluded. I did the historic tour and the Sacromonte tour and both were excellent. Tip as you see fit. 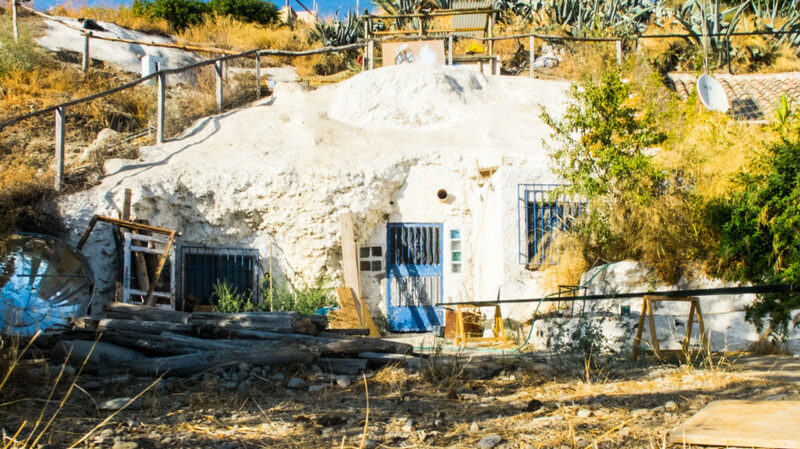 One of the cool cave houses you can see on a free walking tour! If you know when you’ll be in Granada, buy your tickets online at least one week in advance. Ticketmaster in Granada is one of the best ways to get your ticket. Admission into Palacios Nazaries are valid for a 30 minute entry window as marked on your ticket, so make sure you’re there on time! If you don’t book on time, you have to show up around 6:30 in the morning to try for a same day ticket. 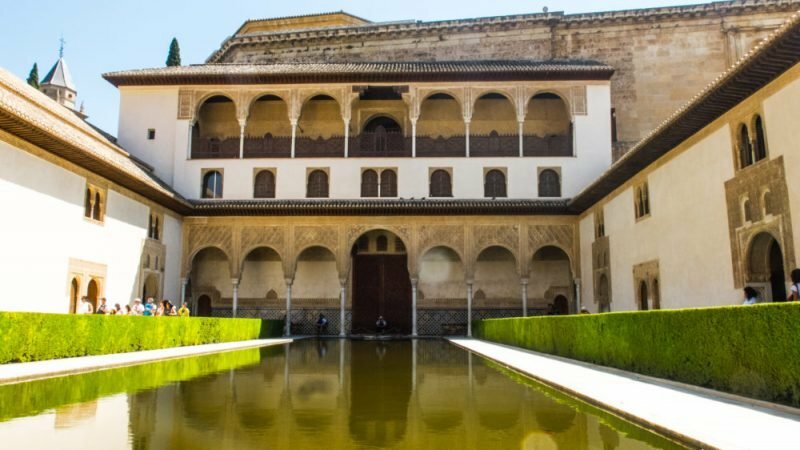 Alternately, you can buy the pricy Granada Card (33.50 euros) for guaranteed access to the Alhambra.